You've found the “U.S. 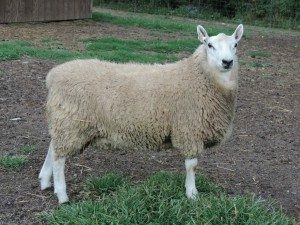 Cheviot Sheep Breeders” page here at Hobby Farm Wisdom! If this is the first time you have visited our site: Welcome! Cheviot sheep originate in the Cheviot Hills in England. They are a hardy breed that can withstand windy, wet and bleak conditions and also hot temperatures with minimal foraging. They have a built frame and display easy lambing, great mothering instincts and fast growth. They have a distinctive white face and a wool-free head and legs. Their ears are pointy and upright and display a black muzzle and feet. This breed is very alert and active, displaying a graceful appearance. It’s considered a long-wool breed and all individuals are polled. There are frequently used as top quality sires for prime lambs. Their sandy white wool is crimped which makes it durable and it is often blended into other yarns for greater resistance and durability. The fleece is springy and dense which helps reduce fleece rot and fly strike. Rams can weigh between 160-200 lbs and ewes between 120-160 lbs. I am looking for white Miniature Cheviot sheep. I live in Florida and would probably need to have the babies shipped – unless they are within an 8 hour drive from Delray Beach Florida.